Professor Rotunda joined the Fowler School of Law in 2008, where he has taught Professional Responsibility, Constitutional Law, and other advanced constitutional law courses. Professor Rotunda was an active scholar throughout every day of his career, including with his most recent book, John Marshall and the Cases that United the States of America (Beveridge’s Abridged Life of John Marshall). In addition to publishing numerous books, Professor Rotunda authored more than 500 articles in various law reviews, journals, newspapers, and books in the United States and abroad. 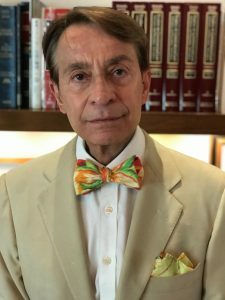 Professor Rotunda’s publications have been cited thousands of times by law reviews, state and federal courts, and foreign courts in Europe, Africa, Asia, and South America. His work has also been translated into French, Portuguese, German, Romanian, Czech, Russian, Japanese, and Korean. Professor Rotunda’s legal career was extensive. After receiving both his B.A. and J.D. from Harvard University, Professor Rotunda clerked for the Honorable Walter R. Mansfield of the United States Court of Appeals for the Second Circuit. Professor Rotunda then worked as an associate at Wilmer, Cutler & Pickering in Washington, D.C., before becoming Assistant Majority Counsel to the U.S. Senate Select Committee on Presidential Campaign Activities. Professor Rotunda then entered academia, joining the University of Illinois College of Law. Professor Rotunda taught on the Illinois faculty for 28 years, including serving as the Albert E. Jenner, Jr. Professor of Law from 1993-2002. Professor Rotunda then taught at the George Mason University School of Law (now the George Mason University Antonin Scalia Law School) from 2002 to 2008, during which time he served as the George Mason University Foundation Professor of Law. Professor Rotunda also held visiting professor positions at several top law schools and served as a scholar and fellow at a number of prestigious institutes and organizations. He joined the Fowler School of Law in 2008 and has been one of its most active faculty members until his passing. There will be a funeral mass for Professor Rotunda at St. Norbert Catholic Church at 300 East Taft Avenue, Orange, CA, 92865, on Monday, March 26, 2018 at 10 a.m. The Fowler School of Law will also hold a memorial service to celebrate Professor Rotunda’s life, and information will be posted once details have been confirmed. With a “Top Schools” ranking in U.S. News and World Report, ABA accredited Chapman University Fowler School of Law is a forum where accomplished faculty members provide students with a combination of personalized instruction and real-world clinical, transactional, and courtroom training. Students can earn a JD, an LL.M., a joint JD/MBA in conjunction with the Argyros School of Business and Economics, and a joint JD/MFA in Film and Television Producing in conjunction with the Dodge College of Film and Media Arts. Additionally, the school offers seven JD Emphasis programs in Advocacy & Dispute Resolution, Business Law, Criminal Law, Entertainment Law, Environmental, Land Use & Real Estate (ENLURE), International Law, and Tax Law. The school’s alumni are making a significant impact in their communities as leaders in law, business, and public service. In 2013, the Fowler School of Law made institutional history when alumnus Dale E. Fowler ‘58 donated $55 million to the school, which was – at the time – the second largest reported gift to a law school.